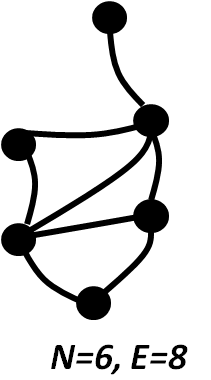 Networks (also called graphs by mathematicians) are simply a collection of vertices (also called nodes) and a collection of edges (sometimes called links). The edges just connect pairs of vertices. The alternative terms noted here already indicate how the terminology of networks is not always fixed. This reflects its long cross-disciplinary heritage with input from mathematicians, social scientists, computer scientists, physicists and engineers amongst others. There are rigorous definitions of some concepts but not everyone uses the same definitions. 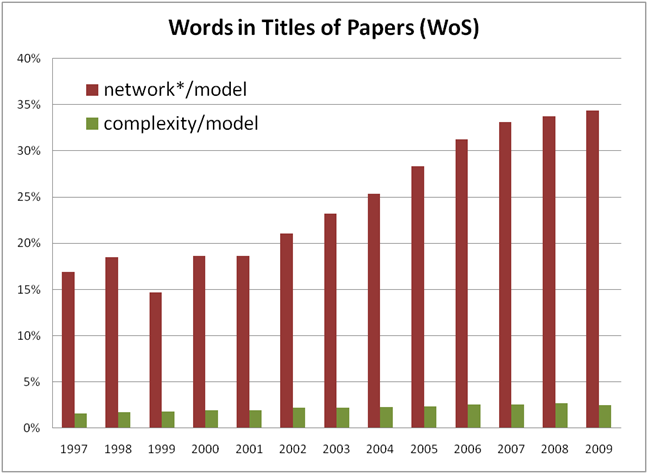 Plot of the ratio of the number of Network papers (whose title contains words starting with Network) compared to Model papers (those papers whose title contains the word model). 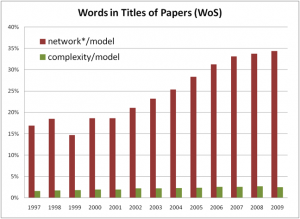 For comparison, ratio of Complexity papers to Model papers is shown in green. There has been an explosion of interest in networks over the last fifteen years. The fraction of papers on networks doubled between 1999 and 2009 (see plot). This phenomenal rise has been driven by the opportunities provided by the vast number of new large data sets and the computing power to analyse them. Their value to society is immense as with the right tools the data provides new windows on human behaviour (e.g. via Facebook or mobile phone usage) and on our complicated infrastructure (e.g. power grids, the internet or transport links). Networks are a natural, useful and extremely flexible way of representing many of these large electronic data sets. For instance the nodes can be web pages and the edges are web links. Another example is where the nodes can be Facebook users and the edges represent connections between them. Networks are a key part of the `digital humanities’ revolution. The arrival of these new data sets brought a new wave of interest from physicists around in 1998 (Watts and Strogatz). In particular scale-free networks were those thought to have certain types of power-law distributions within them (e.g. Barabasi and Albert, 1999). on Complexity in Istanbul in September 2011. In 2010, I gave an invited talk in Manchester, entitled “The Mathematical Description of Networks“. Finally in May 2005 I gave a colloquium for the Physics Department of Imperial College entitled Complex Networks: Six Degrees of Separation and all that . For a wider range of resources for networks some including courses and texts (some of which are free) see links under resources.